Since 2008, Campbell’s Construction has provided residents and businesses in Basking Ridge and the surrounding areas with excellent and affordable construction work. Whether you need professional roofing or landscaping work, the experts at Campbell’s Construction can be sure that your home or business remains in the best and most beautiful condition possible from top to bottom. We employ only the highest quality materials and work ethic to ensure that any work you get from us will last for many years to come. You deserve to get more than what you paid for. And speaking of money: At Campbell’s Construction, you won’t be going broke just to get the home or business you want. We offer competitive prices so that any resident can afford any kind of home renovation that our Basking Ridge remodeling company offers. Should you want to repair damages on your old roof or completely replace it, the experts at Campbell’s Construction have the skills to be sure you get the roof you need. Then, once you get your feet and focus back on the ground, you might notice that your lawn is in need of an overhaul. If that’s the case, fret not! 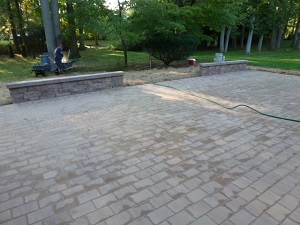 The experts at Campbell’s Construction are adept landscapers. We can get your lawn looking the way you want it to while also being able to remove any errant debris so that your lawn looks absolutely beautiful. Time and the elements will eventually take their toll on your roof. Sometimes, that toll requires just a repair to undo. Other times, though, you need to replace your roof entirely. In either case, the New Jersey remodeling contractors at Campbell’s Construction have the know-how to get your roof in the best condition that it can be in. Whether you need some shingles replaced or gutters repaired, we at Campbell’s Construction can get your roof looking like new again. And we specialize in a variety of different roof types, meaning that you can always rely on us to get your roof replaced, no matter the material or style. Your lawn is among the first things people will notice when they see your home or business, and to make the best impression you can, you want your lawn to be in beautiful condition. We at Campbell’s Construction can get your lawn in that shape with our variety of landscaping services that include planting trees and shrubs and bushes, spreading mulch and stone and topsoil, and spreading mulch and stone and topsoil. And when we’re done with those services, we also provide cleaning-up services to clear out any mess that blots your lawn: natural or construction-based. If you are looking for a reliable remodeling contractor in Basking Ridge, NJ then please call Campbell’s Construction at 732-623-9790 or complete our online request form.